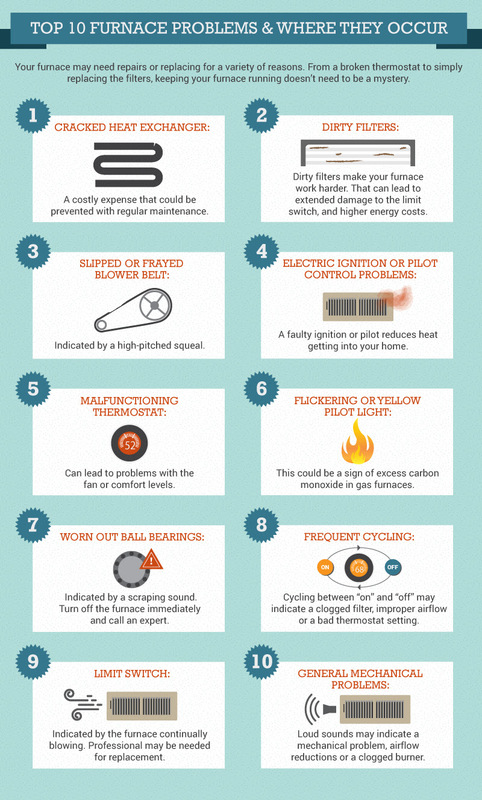 Below are the 10 most common furnace problems. Read on for advice on how to repair and fix future furnace problems. Lack of maintenance: You fail to schedule annual furnace maintenance and inspections that could prevent unexpected problems and breakdowns. These routine inspections can help the appliance run more efficiently and reliably. Dirty filters: Dirty or clogged air filters reduce airflow, making a furnace work harder to circulate. In some cases, a clogged filter may damage the limit switch, which controls the fan. Wear and tear: Normal wear and tear can cause airflow problems, heat control-related problems or even overheating. Electric ignition or pilot control problems: A faulty ignition or pilot could make it difficult to heat a home or commercial space. Thermocouple problems, drafts or clogs in the appliance may result in an unlit pilot light. Malfunctioning thermostat: A faulty thermostat can lead to problems with the fan or comfort levels. The furnace doesn’t heat at all: A furnace that doesn’t perform its main task may have problems with the thermostat setting, power, gas or the pilot light. The furnace doesn’t heat enough: In addition to a clogged filter, a furnace may not produce enough heat if it’s the wrong size for space. Frequent cycling: Cycling between the “On” and “Off” modes may indicate a clogged filter, improper airflow or a bad thermostat setting. The blower continuously runs: Blower issues may indicate a problem with the limit switch, which a professional may need to replace. The furnace is too noisy: Rumbling, squeaking, and rattles aren’t normal. The sounds may indicate a mechanical problem, airflow reductions or a clogged burner. Change the air filters: Dirty air filters lead to a multitude of furnace problems. Clean or replace the filter one a month, according to the manufacturer’s directions. A furnace repair professional can show you how to do this. Check the thermostat: If it seems as if your furnace doesn’t produce any heat, check the battery level in the thermostat. In some models, simply replacing the battery may do the trick. When the blower fan doesn’t turn off or the furnace cycles too frequently, check the thermostat settings. The fan setting should be on “Auto.” In the “On,” “Low,” “Medium” or “High” modes, the fan will run continuously. If the furnace doesn’t seem to produce enough heat, check the thermostat’s setting to make sure it’s on “Heat” mode. Then check the temperature to make sure it’s set to one that’s higher than the current room temperature. If nothing seems to work, you may need to purchase a new furnace. Make sure the new thermostat matches your furnace in regards to capability and capacity, or you may encounter future problems. In addition to the below, here are residential heating tips. Check the circuit breaker and power supply: If the furnace stops working or the thermostat’s screen is blank, check if the circuit breaker tripped or blew a fuse. Also, make sure the power cord is plugged into an outlet. Reduce drafts: If a draft causes problems with the pilot light, you may need to close the windows or doors in the room. Maintenance: Every year, at the end of the summer or beginning of fall, hire a furnace repair specialist to inspect and maintain the furnace. The professional will get the unit ready for the upcoming cool weather and fix problems that could cause breakdowns or expensive repairs during busy winter months. Furnace installation: If you need to replace your furnace, use a furnace contractor’s expertise to determine the right type and size for your home or commercial space. Ignition control or pilot light problems: As problems may result from clogged components or faulty electrical components, leave ignition issues to the experts. Mechanical issues: Unless you received training to repair furnaces, let professionals handle problems related to mechanical wear and tear. Otherwise, you may void the warranty on the appliance or accidentally cause a larger problem. Natural gas or propane problems: When you suspect problems with the gas feed or valve because of a malfunction with the gas pressure regulator, call a professional for help. When troubleshooting your appliance doesn’t solve your furnace issues, never hesitate to contact a trained HVAC contractor. Any furnace, regardless of its age, may pose combustion- or gas-related safety hazards, so it’s always a good idea to have an expert examine the unit and suggest the best course of action.